Fortune has not been with this 76 years old man till date. Mr A K Suresh the only breadwinner of his family met with an accident last month. Mr Suresh who stays in Kuvempu nagar, Jaraganahalli, Bangalore, met with an accident in the month of march, when a motorcyclist hit him while he was crossing the road. He was taken to near by hospital and the doctor there found a hairline fracture in the hip and advised for a months rest after doing the first aid. Mr Suresh was in a state of shock and was unable to make a note of the motorcyclist number. After 6 weeks, the fracture did not heal and Mr Suresh was not able to walk without any support. Then he was taken to Vasavi hospital and consulted Dr Srivatsa Subramanya by his friends. 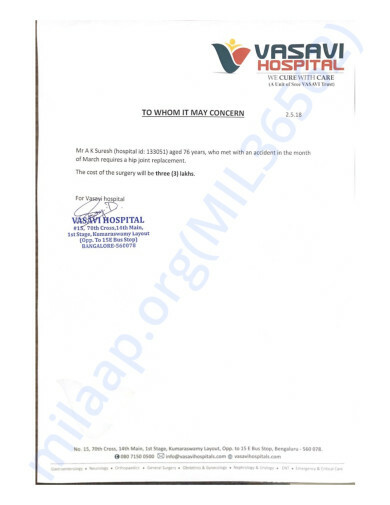 Dr Srivatsa advised for a CT scan to be done after examination. He found out that the left hip joint had a major fracture and now needs a surgery, which will cost about 3 lakhs. Mr Suresh who works as an office assistant in BNM college, earns about 16,000 per month and is the only breadwinner for his family. His wife, Mrs. Savitri is homemaker and his son Raghavendra who is 33 years is differently abled child. Mr Suresh has been taking care of his family from past 45 years. He is taking care of his son with all the medical treatment required. But after this accident Mr Suresh is unable to work and he is finding it difficult to make run the family. He urgently needs the surgery to be done so he can start working and help his family. As the financial condition of Mr Suresh is weak, on behalf of him we request for donation and help him lead a normal life again. 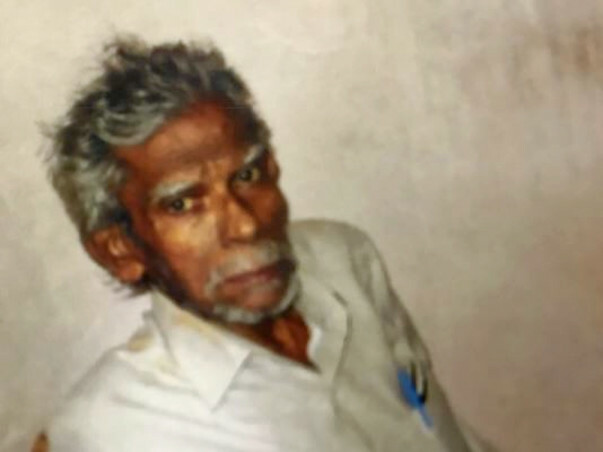 Mr Suresh had undergone his surgery recently after which he had serious respiratory problems which his body couldn't handle, leading to his demise. Please pray for his soul to rest in peace. The funds raised will be utilized to clear his medical dues. Thank you all for the support and love.